For Montreal artist James Kerr (known on the Internet as Scorpion Dagger), Renaissance art is a perfect medium for making fun of the modern era. 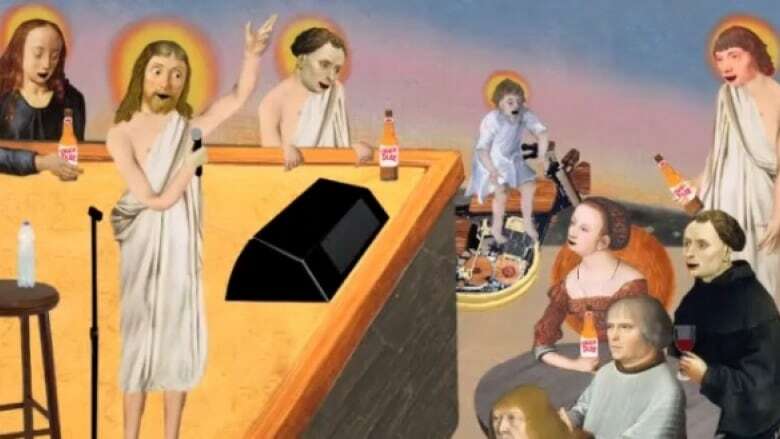 His animated GIFs, inspired by art history, are as poignant as they are funny, and the internet loves them. The Renaissance era saw humanity emerge from the dark ages, and unwittingly paved the way for this creepily unnatural state of hyper-comfort we call modern life. For Montreal artist James Kerr (known on the Internet as Scorpion Dagger), however, Renaissance art is a perfect medium for making fun of the modern era. His animated GIFs, inspired by art history, are as poignant as they are funny, and the internet loves them. So does CBC Arts — in the first episode of Exhibitionists, CBC Arts' TV show debuting this Sunday (HINT HINT), Kerr's animations feature prominently between segments. We caught up with Kerr to talk about art, garbage and hot dogs. How did you become interested in Renaissance art? When I started making GIFs I used my previous work, more traditional stuff I had made on canvas and paper. Once I ran out of my own stuff, I kept looking at different images to animate, and I just kind of fell upon Renaissance paintings. I was going through books I had around the house, and I was looking at Renaissance paintings and I just loved them. Did you find humour in them that you could start digging into right away? One of the artists I first got excited about was Lucas Cranach the Younger. If you look at some of those paintings, the faces are pretty hilarious. They're almost funny on their own. Does anything about Renaissance art remind you of us today? I have the sense that we haven't really changed too much. We're pretty much the same people, and if you look at this art, you can see a lot of us in the expressions and in the way they're portrayed. To me, it's very familiar. How did this end up becoming your niche? When I first started, the plan was to make a GIF a day for a year and then to find a space to show it. And then I just fell in love with making them, and I started getting contracts and having galleries interested in showing them. And then you were like, "I'm going to take the name of my Dungeons and Dragons wizard." [Laughs.] One day my friends and I decided to come up with cool nicknames for ourselves, and I came up with Scorpion Dagger. I thought it was pretty neat and they all hated it. Then my friend hosted a gallery show, and I submitted a piece of art with the name James 'Scorpion Dagger' Kerr, because I knew it would piss him off and piss off a lot of my friends. So when I started my blog I called it Scorpion Dagger just to see what would happen. But nobody really calls me that. Where do you find inspiration for your subject matter? A lot of it comes from random observations of things that happen to me during the day. One of the latest ones I did has a guy walking through a spider web, and that same thing literally happened to me that morning. All of them are like that. Something will happen to me and I'll think it would make a good GIF. What's up with the hot dogs? What a lot of people don't know is that they're actually veggie dogs. But yeah, it's definitely a pretty common motif. One of my favourites is the one with the guy who's fishing, and the DeLorean from Back to the Future pops in and dumps a bunch of garbage and then pops back out. Because so many people are like that: they shove their problems where they can't see them, and they think everything is going to be fine. That's exactly what I was going for, about people just being disrespectful, not thinking ahead about the consequences of what they do. And one of my friends pointed out that trash actually fuels the DeLorean. So Marty McFly is unwittingly screwing himself over. Where do you want to go next with these GIFs? I've been very resistant to this in the past, but I'm opening up to the idea of longer animations, like one to three minutes. Another thing I'd like to do is make a game with some of the characters and explore these worlds in a bit more detail. Maybe give them a voice, a literal voice. Have we been pronouncing GIF wrong this entire time? Yeah, but that's okay. That's how I pronounce it. "Jiff" doesn't make sense. It's terrible. I get that the guy who created it wants to call it that, but I can't do it. Watch the premiere of Exhibitionists Sun, Oct. 4 at 4:30 p.m./5 p.m. NT on CBC-TV.